Keet áyá yáat. (This is the Killer Whale.) Yaa haa Lingídee, kéi haa nasdagee. (Representing Tlingits, when we were migrating.) On the back, there are waves to remind them of when we were migrating from down south. 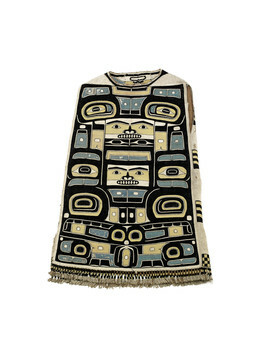 This Chilkat tunic depicts the Killer Whale. Its head takes up the lower half, including large eyes above a wide mouth and row of teeth. Two round nostrils appear in the center of the mouth. The whale’s blowhole is indicated by the spirit face at the center of the shirt; and its body, by the larger face directly above that. The flukes spread across the top part of the shirt and smaller designs along the sides show the fins. Waves woven on the back refer to the ancient migration of the Dakl’aweidee, owners of the Killer Whale crest. Donald Gregory: Again this one has the two claws at the bottom. . . .
Clarence Jackson: Okay Don, well tell us what it is. Donald Gregory: This one looks like the diving killer whale again with the air bubbles and the teeth. Rosita Worl: . . . Look at that, fine huh? Delores Churchill: It is really fine. Delores Churchill: . . . These waves, I know they’re very difficult to do. That’s why I wanted to turn it over when I saw the waves, very hard to weave that in. And those always have the ghost face in the back. And maybe Anne you could tell us why they always have the ghost face on the back of these tunics. Anna Katzeek: So it can protect the person who is wearing it. That’s why it’s towards it. Du káx át yá.aa yáx áwé yatee, át daat yawsitúk [it is protecting the person; it is watching over things]. Delores Churchill: And do you know why they have this too? It’s almost like wings? They’re almost on every one of them. Anna Katzeek: That’s just the designs. Anna Katzeek: And I would just like to mention all these are woven with cedar so the moths won’t get into them. Delores Churchill: Right the warp. . . . You can tell they’re very even. So you count each one you turn as you go down. It’s made with a hangman’s knot. Do you know what the Tlingit call a hangman’s knot? So you just wrap it around, a loop, and then you pull it down. Anna Katzeek: They call it Kun Hadee [Hangman’s Knot]. Delores Churchill: And this is pretty typical of how they make the back on tunics. They would do the weaving – “spaced weaving” is what we call it in basketry. . . . and that’s what we call “compact climbing.” But there’s a lot of red cedar in this. This is really a beautiful one, very beautifully made. And again it’s mountain goat wool. Some of the later pieces that you see in museums are made with domesticated sheep wool. But the early ones, like this one, sometimes you could see the guard hairs. But this one, somebody really spent a lot of time taking out the guard hairs. Because the others we saw, I forgot to mention, there was guard hair in the warp, not in the weavers but in the warp. But this one, they took time to take all the guard hair out. There’s one guard hair right there [at bottom], a little tiny one. Anna Katzeek: I just remembered those are waves, [representing] when our people migrated. . . I just remembered this is Keet [Killer Whale]. Keet áyá yáat [This is Killer Whale]. Yaa haa Lingídee kéi haa nasdagee [as Tlingit when we were migrating]. Ach áyá yéi yatee, Keet [Killer Whale, that is why it’s that way], waves. I just mentioned when we were migrating from down south, this is waves, and they put in on their designs to remind them. To learn more about the history of this object, read a report by Smithsonian conservators at http://anthropology.si.edu/accessinganthropology/alaska/gallery_tunic.html (copy and paste this address into your internet browser).